Local Government is at the heart of local communities. Councils look after the most vulnerable in society and make local spaces greener, cleaner and safer. Yet over the last nine years this disastrous Tory government has targeted its austerity agenda at the most deprived areas of the country including our own region. Whilst the Conservative voting areas have – in relative terms – been spared the worst of the cuts. This has all been done through the guise of manipulating existing funding models, but due to Government proposed changes it’s about to get worse. In late December whilst attention was focused on Brexit the government proposed to change the way it gives funding to councils. Instead of focusing on the most deprived areas or those with the most need they’ll introduce new funding streams predominantly aiding more affluent Tory areas. This at a time when the Government should be reinvesting in our most at need areas not cutting them ever more to the bone. The fact is between 2010 and 2020, councils will have lost 60p out of every £1 that the Government provides our communities for services. This has left local services today facing a funding gap of £3.2 billion. And by 2025 the gap facing Local Councils will rise to £7.8 billion. In addition, the most deprived areas of the country are being hit particularly hard. Nine of the ten most deprived councils in the country have seen cuts of almost three times the national average cut of £243. 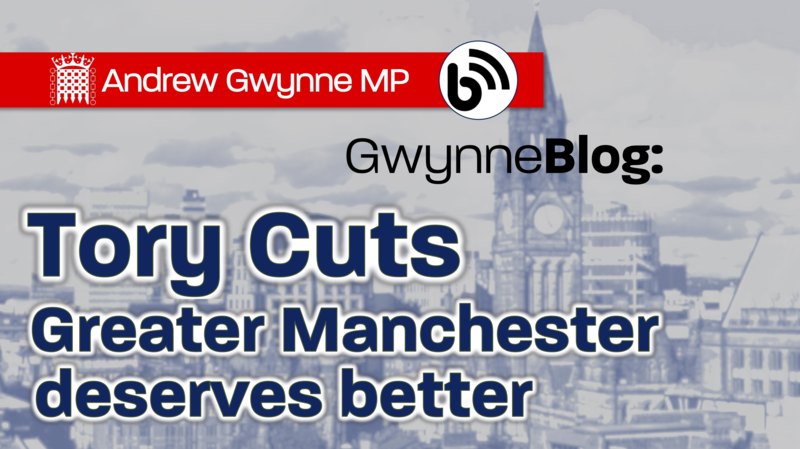 On average Greater Manchester households have lost £577, with cuts ranging from £293 per household in Stockport to Manchester, the fifth most deprived area in the council which will see a cut in council funding of £902 per head. This is unfair, yet indicative of a Secretary of State who’s turned his back on the most at need. This really is a crisis of the Tories’ creation, but as ever they are pushing the blame on to councils, communities, carers and families. Homeless people will go unhoused, elderly and disabled people will go uncared for and vulnerable children will go unprotected. In one of the wealthiest countries in the world, this is an unacceptable. The deterioration of social care alone will fundamentally damage the fabric of society as we know it. Huge amounts of money have been taken out of the system, despite obvious rising demand. At the local election this May lets send Theresa May a message that we know the Tories don’t stand up for working people and that they are putting family prosperity and Britain’s future at risk. Only Labour can stand up for working people, so this May 2, we need to elect as many Labour Councillors as possible to stand up for our local communities.